In preparation for the celebratory holiday of Hanukah, the Marcus Jewish Community Center of Atlanta (MJCCA) is pleased to present several community-wide Hanukah programs, at various locations across the city. 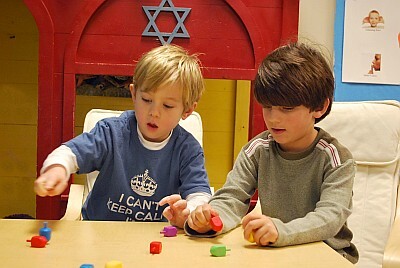 Visit www.atlantajcc.org for a complete schedule of activities. Step away from the stove and enjoy dinner in Dunwoody at one of the many restaurants that will be serving Thanksgiving feasts and fancies. Visit their landing pages to make a reservation today. You will be thankful you did! It's no secret that Dunwoody is home to great shopping! With Perimeter Mall located right here and dozens of surrounding nationally-known favorites, we have an abundance of shopping selections. But, hidden in between are local gems that can't be found anywhere else. This holiday season, make a stop to shop and support these local businesses! This report on the financial feasibility of forming a Dunwoody Independent School District was commissioned by the City of Dunwoody, through the Dunwoody Parents Concerned about Quality Education, a community group formed in 2013 to explore opportunities to improve public education in Dunwoody. 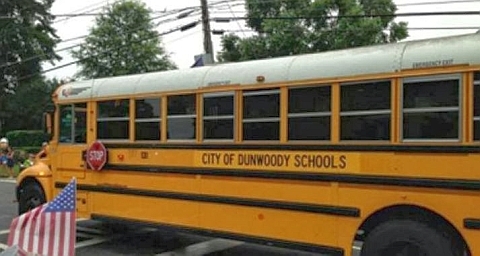 Dunwoody’s public school students (6,082 students in 2012) attend one of the seven public schools located within the city limits. All of these schools are currently under the management and supervision of the DeKalb County Public School District (97,297 students in 2012). Together, the seven Dunwoody schools comprise a relatively self-contained cluster that could conceivably be operated as an independent public school district. The report is specifically designed to assess whether educational services provided to the recently founded City of Dunwoody by the DeKalb County School District could be provided more efficiently with a leaner organizational form. The question is whether a Dunwoody Independent School District (DISD) can potentially manage a single ‘cluster’ of Dunwoody schools (one high school, and ‘feeder’ middle school and elementary schools) and deliver the same or better district educational and management services at lower cost. Such organizational reform may be not only financially prudent but would facilitate the classroom-centered and child-centered operations without the organizational encumbrances of a district organized to serve 98,000 children. Significant changes in information technology have substantially altered the economies of scale arguments that previously argued for larger school districts. Smaller districts are consistent with educational reform that emphasizes child-centered education. This report assesses the financial feasibility of a smaller Dunwoody Independent School District with analysis of the most detailed and accurate available data. We reallocate the sources of revenue and allocations of cost from the current consolidated DeKalb County School District (which now supervises Dunwoody schools) to project revenue and cost allocations as if a separate and independently controlled Dunwoody School District (DSD) had existed in 2012. We also reallocate resources based on the number of students who would transfer into schools within the new boundaries as well as students who are expected to move from private schools into the new DISD. The Dunwoody schools are currently managed and controlled under the operational and financial umbrella of the DeKalb County School. If the Dunwoody cluster of schools were managed under a separate and independent school district, some current sources of revenue would follow students and schools to the new Dunwoody Independent School District (DISD). Other revenues would remain allocated to what we term the deconsolidated DeKalb County School District (DDCSD). The allocation of 2012 revenue to either the independent Dunwoody district or the deconsolidated DeKalb district depends on detailed and specific characteristics of the two student populations, supporting communities, and the experience and educational profile of the assigned teachers. Likewise, the analysis reallocates the consolidated DeKalb County School District 2012 costs between an independent Dunwoody district and a deconsolidated DeKalb district. Using line-item cost detail, we calculated those operating costs of the DISD that are required for each new school, classroom, and student. These estimates of various fixed and variables costs allowed us to project cost shifts for students who would transfer to new schools across new boundaries and student currently in private schools who are projected to transfer to DISD. This reallocation of revenues and costs (including projected costs of a new Dunwoody Independent School District central office) allows the conclusion that deconsolidation and formation of an independent school district is financially feasible for the City of Dunwoody. In fact, projected revenues for a separate Dunwoody Independent School District from local property tax allocations, state funding, and federal funding would have been $78.7 million in 2012 (based on student and community characteristics, teachers’ profiles and current laws and regulation). Costs of $37.8 million in 2012 would no longer have accrued to a deconsolidated DeKalb County School District, but would have fallen to a new Dunwoody district. 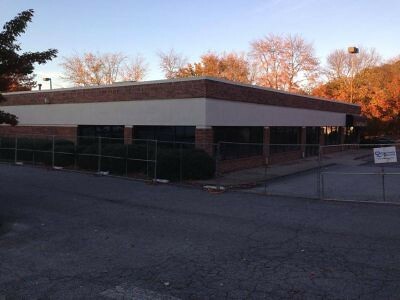 Costs for operation of a Dunwoody central office and services are projected to be $10.3 million. On net, revenues for operations of an independent Dunwoody school district would exceed school and district operating costs by $30.7 million annually. Reallocation also has consequences for a deconsolidated DeKalb School District. After significant wealth-reallocation transfer by state and federal authorities, a deconsolidated DeKalb would lose $77.3 million in revenue (out of a consolidated total of $863.6 million) and $50.5 million in costs. A loss in local revenues of $57.2 million is mitigated as state and federal funding grow as a share of total funding. The net reduction in resources available to DeKalb after deconsolidation is $26.8 million. This is the equivalent of $293 per student per year. The detailed 25 page report can be found here. An annual community event to welcome the holiday season, Light up Dunwoody Christmas Village opens at 3:00 pm and concludes with the lighting of the tree at 5:45 pm. The ceremony will include a Hanukah song and remarks from Rabbi Brian Glusman from the Marcus Jewish Community Center of Atlanta. Thank you to the sponsors of Light Up Dunwoody! Dunwoody HS Band Silent Auction ends tonight at 9 pm - Great deals to be had! 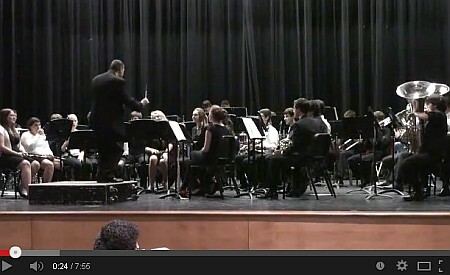 The Dunwoody High School Band Needs You! Our award-winning band continues to experience growing pains. Your participation in our 2nd annual auction will help provide support to a wonderfully enriching organization for the kids! In addition to the ongoing cost of managing the band (band camp, game day meals, scholarships, etc. ), we are hoping to replace a number of aging instruments — some as old as 1972! Thanks to so many incredible donations from around the Dunwoody community, we have been blessed with a wide variety of exciting auction items — over 150 items with a value over $13,000 !!. Please wander through everything! Then make a bid. Remember, all proceeds directly benefit the Dunwoody High School Band, so don’t hold back! Trust me when I tell you that State Farm job opportunities in Dunwoody will be numerous in coming years and if you want to get in on the ground floor of explosive growth, start looking now. 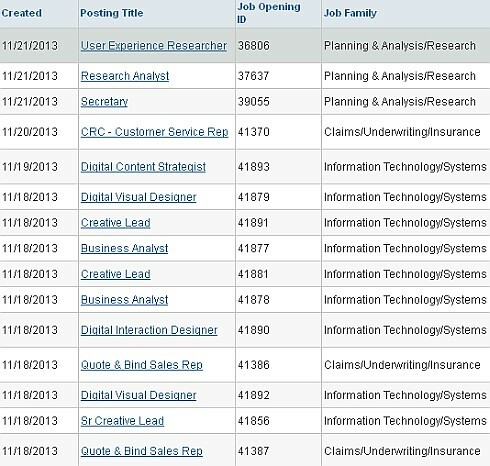 All of the positions below are in Dunwoody and several of them are for more than one position, for example the "User Experience Researcher" has 11 positions to fill. The City of Dunwoody will host an open house to gather feedback on a rendering for the 5-acre park to be located at the corner of North Shallowford Road and Pernoshal Court. The park is part of the 19-acre property in the City’s on-going Project Renaissance redevelopment initiative. The park concept is based on desirable park elements as brainstormed by the community in the Parks, Recreation, and Open Space Master Plan as well as meetings and a charette held September 2012. Key features of this 5-acre park include an amphitheater with terraced seating, two playgrounds, a multi-purpose sport court, and passive recreation and picnic areas. In addition to the traditional open house, a brief presentation on the timeframe for the new park development will be delivered to attendees at 7:15 p.m. The goal of the open house meeting is to share the updated park concept with the community and garner feedback. Community feedback will be shared with the Mayor and City Council at theDecember 9, 2013 City Council Meeting. 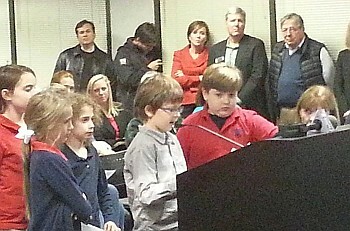 Various Dunwoody Updates, Monday meeting, website, animals, electronics and park design. An extraordinary amount of poise and class was exerted by the Chesnut Charter Elementary students who each came to the podium to exalt the benefits of city wide emergency sirens. Sadly the same can't be said by some others who were in the room and should have been taking lessons from these kids. In many ways Monday's meeting was like many others, we listened to various presentations, reviewed and voted as needed. Strong opinions filled the air, some factual, some emotional - all valid to the person expressing the opinion and we listened to what was being said. The streaming video kept being knocked off line but there are seven segments that were recorded and they can be found here. One of the items presented to Council was the webpage redesign presentation whereby at the December meeting there will be a contract presented to the winning firm of Jesse James Creative, Inc. and here is a copy of the powerpoint outlining the proposal and our request. If you are in web design please feel free to comment on the proposal and the firm's work. The firm provided a few examples of their work and I see a few nice touches but also some limitations. Everyone of the pages has a search bar so I searched "Jesse James" looking for their contract or city council action and only found limited information at best. The backend of the city will still be tied to SIRE for documents as will the video streaming and it is my hope that the last five years of documents will be indexed and searchable through the new front end being designed by Jesse James. I am also told that Sire may be upgrading the Video package in January that might be moving away from Silverlight? Do you remember the discussion on the total number of animals to be allowed in the home? Here is the proposed replacement ordinance which I believe hits to the heart of the problem attempting to be solved. 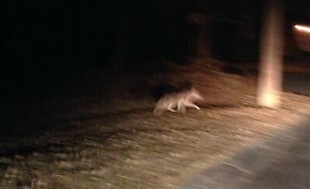 As far as animals, I received an email this evening with a photo showing a coyote wandering around on Andover Dr in Dunwoody North so please take appropriate action. As I will be stepping away from the computer for a few days... On Saturday there will be an electronics recycling event, then on Tuesday there will be a meeting as to what amenities should be included in the park at Shallowford and Pernoshal. I think a few active basketball courts would work well as we tore down one hoop to build out the 16 acre pipefarm. The park will be situated on the Brook Run Trail immediately between two playgrounds made for children therefore I would like to see some amenities that are not available at the other two parks. Also on Saturday, Ms. Bobbi Sedam of the Friends of Brook Run Park Dunwoody will be conducting a work day at 10 am to meet at the entrance to the multiuse trail off the parking lot behind the skate park at Brook Run. Bring your hoe, rake, gloves, water bottles, clippers if you have them and your terrific selves. She will bring hot apple cider, hot chocolate, pumpkin bread and Kleenex......it will be cold. DeKalb County's unilateral decision against Druid Hills Charter Cluster forces fight to Georgia Legislature for independent school systems. Next round will be fought here at the Capital. As per Maureen Downey of the AJC, In a contentious 5-4 vote tonight, the DeKalb County Board of Education rejected the Druid Hills Charter Cluster petition. The "no" vote followed about four hours of tense debate. 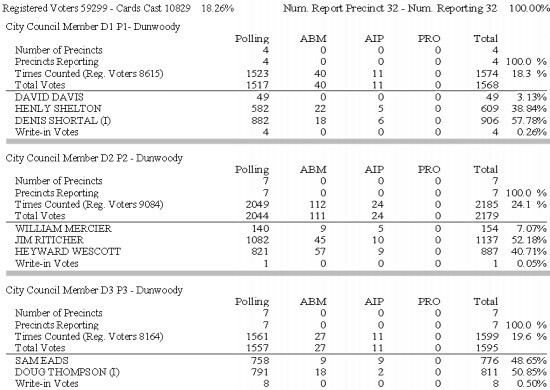 Those voting for the cluster were Thaddeus Mayfield, John Coleman, Marshall Orson and Jim McMahan. 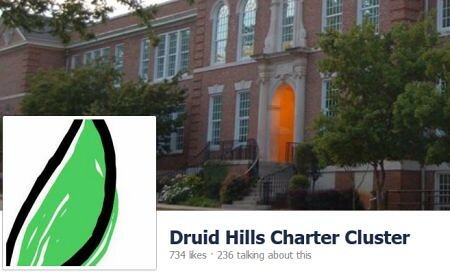 The charter petition would have put Druid Hills High School and six feeder schools under the management of a nonprofit organization and freed them from the reach of the central office. The cluster of schools would have its own administrators and board of directors. The petition, the first in Georgia involving the conversion of a cluster of traditional public schools, had to win the blessing of the school board to proceed as there is no appeals process in the state law. 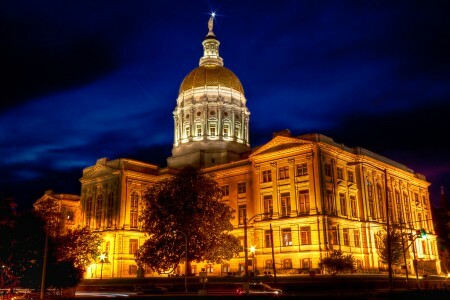 With no other options, the fight for an independent school system moves to the State Legislature where HR 486 presented by Representative Taylor of Dunwoody offers options for new local school systems. Proposing an amendment to the Constitution so as to authorize any municipality created on or after January 1, 2005, and any municipality which is contiguous to a municipality created on or after January 1, 2005, irrespective of whether such municipalities may be in different counties, to establish individually or collectively by local law an independent school system; to provide for related matters; to provide for the submission of this amendment for ratification or rejection; and for other purposes. School systems continued; consolidation of school systems authorized; new independent school systems prohibited. Authority is granted to county and area boards of education to establish and maintain public schools within their limits; provided, however, that the authority provided for in this paragraph shall not diminish any authority of the General Assembly otherwise granted under this article, including the authority to establish special schools as provided for in Article VIII, Section V, Paragraph VII. Existing county and independent school systems shall be continued, except that the General Assembly may provide by law for the consolidation of two or more county school systems, independent school systems, portions thereof, or any combination thereof into a single county or area school system under the control and management of a county or area board of education, under such terms and conditions as the General Assembly may prescribe; but no such consolidation shall become effective until approved by a majority of the qualified voters voting thereon in each separate school system proposed to be consolidated. No independent school system shall hereafter be established; provided, however, that any municipality created on or after January 1, 2005, and any municipality which is contiguous to a municipality created on or after January 1, 2005, irrespective of whether such municipalities may be in different counties, may establish individually or collectively by local law an independent school system." Shall the Constitution of Georgia be amended so as to authorize any municipality created on or after January 1, 2005, and any municipality which is contiguous to a municipality created on or after January 1, 2005, irrespective of whether such municipalities may be in different counties, to establish individually or collectively by local law an independent school system?" All persons desiring to vote against ratifying the proposed amendment shall vote "No" If such amendment shall be ratified as provided in said Paragraph of the Constitution, it shall become a part of the Constitution of this state. 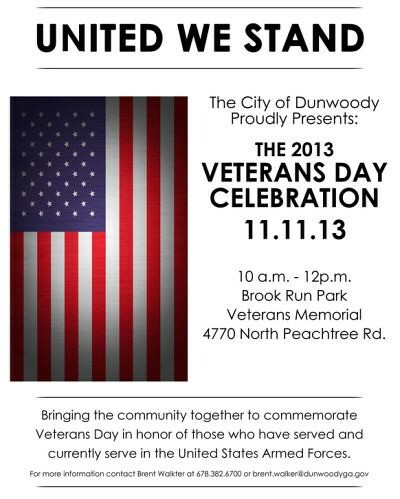 Dunwoody Veterans Day Ceremony at 10 am and local businesses pay tribute to those brave men and women who have served. Time:10 a.m. - 12 p.m.
Every year on Veterans Day, Americans pay tribute to those brave men and women who have served or are currently serving in our armed forces. “USA Today” wrote on Nov. 10, “Savvy vets and active military can eat their way for free through Veterans Day this year.” As updated by The Military Wallet on Nov. 9, the Veterans Day free meals and deals are numerous this year. Veterans Day 2013 freebies include not only free food, but also free haircuts, discounts and more on Monday, Nov. 11. Free Veterans Day Dinner at Chic-fil-A on Jett Ferry in Dunwoody from 5 to 8 pm. Last year, Applebee's served more than 1,000,000 free meals to military veterans and active service members. It’s is again offering a free meal to military veterans and active duty service members on Veterans Day, Monday, Nov. 11. There will be seven entrées to choose from including Fiesta Lime Chicken, Three-Cheese Chicken & un-Dried Tomato Pasta (new for 2013), Double Crunch Shrimp, Bacon Cheddar Cheeseburger, 7-oz. House Sirloin, Chicken Tenders Platter, and Oriental Chicken Salad. For more information, head to the Applebee's website. All military past and present receive their choice from a special Veteran’s Day menu that includes Oldtimer with Cheese, Chicken Crispers, Margarita Chicken, Classic Turkey Sandwich, Grilled Chicken Sandwich, Soup & Salad Combo, Full Flatbread, Pizza, or a Lunch Combo (during lunch hours). 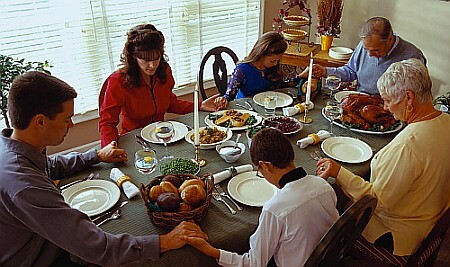 The meals are available for free on Monday, Nov. 11. Dine-in only; beverages and gratuity not included. In addition, Chili’s will donate 10% of its net sales on Sunday, Nov. 10 to the Wounded Warrior Project. For more information, visit the Chili’s website. This Veterans Day, all vets and current service members will receive a free meal on Monday, Nov. 11. Options include unlimited soup, salad and breadsticks, Sausage & Peppers Rustica, Seafood Alfredo, Chicken Parmigiana, Cheese Ravioli, Spaghetti with Meat Sauce or Venetian Apricot Chicken. All free meals include garlic breadsticks and choice of soup or salad. Free Veterans Day meals are available all day during business hours on Monday. In addition, all current military service members and their families will be treated to a 10% discount all November in honor of Military Family Appreciation Month. On Monday, Nov. 11, all veterans and active duty military will receive a free pizza with proper I.D. To RSVP, head to the specially designated Veterans Day Facebook page. To thank America’s heroes for their endless dedication and service, Denny’s is giving away never-ending stacks of its famous buttermilk pancakes to active, inactive and retired military personnel on from 6 a.m. – 2 p.m. on Monday, Nov. 11. For more information, check out the press release. From 11 a.m. – 2 p.m. on Nov. 11, TGI Fridays is offering a free lunch to all vets and active duty military service members. Head to the restaurant’s website for locations and more information. On Monday, Nov. 11, Hooters invites all veterans and current servicemen and women to enjoy a free meal, up to $10.99 in value with any drink purchase, by presenting a military ID or proof of service at any Hooters location across the country. For more info, check out the official press release. Present your military ID or wear your uniform to receive a free doughnut and small coffee on Nov. 11 at any Krispy Kreme location in the U.S. No purchase necessary and no coupon is required. On Nov. 11, all veterans and active duty military will be treated to a free tall (12 oz.) hot coffee for them and their spouse at Starbucks. Einstein Bros. Bagels and Noah’s New York Bagels will offer a free bagel with any topping to all active, inactive and retired military personnel on Nov. 11 from 5:30 a.m.-5 p.m.
Military members who visit Great Clips on Nov. 11 will receive either a free haircut that day or a free haircut card to redeem by Dec. 31. Click here for more information. Please join Dunwoody resident Nancy Jester for her campaign kick-off! Monday, November 11th, 3:30 p.m. Brook Run Park playground in Dunwoody. Former DeKalb School Board Member Nancy Jester will make her candidacy for Georgia State School Superintendent official tomorrow afternoon in Dunwoody. Greg Williams of Greg’s List had the opportunity to catch up with Nancy at the Dekalb County GOP Headquarters opening on Sunday, November 10 for a unscheduled Q & A. He had the chance to ask Nancy a few pertinent questions about her candidacy so check out Greg's site. Finally the other big news in education is the DeKalb school board is scheduled to vote Monday on the petition to put Druid Hills High School and six feeder schools under the management of a nonprofit organization. The cluster would operate under its own administrators and board of directors. If approved by the board Monday and the state board later, the Druid Hills charter cluster will be the first in Georgia. 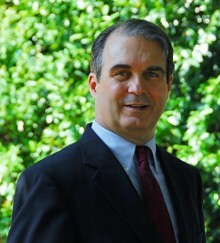 Read AJC columnist, Maureen Downey for more details. Dunwoody commemorates milestone of 5 miles of sidewalks. The City of Dunwoody commemorates another infrastructure and paving milestone with the completion of the city’s 5th mile of sidewalk paving. The city hosted a commemoration and ribbon cutting event at the corner of West Fontainebleau Court and Happy Hollow Road in Dunwoody to observe the sidewalk paving landmark. Work continues on several critical sidewalk projects as part of the city’s sidewalk improvement plan created to provide an objective process to prioritize the city’s sidewalk projects. The city has identified over 21 miles of future sidewalk improvements and 87 future ADA-compliant sidewalk ramps. Following the completion of this year’s sidewalk construction, the City will have invested nearly $1,000,000 and completed roughly 5.4 miles of new sidewalk infrastructure since 2009, making Dunwoody a safer, healthier, and more enjoyable community for all. This has been accomplished in a relatively short timeframe with no tax increases and no need to borrow money. The city continues its commitment to maintain and improve its roads by investing over $2,000,000 in paving this year which is more than 40 percent of the city’s entire 2013 capital budget. Since 2009, including this year’s investments, the city has spent more than $6,500,000 paving the city’s estimated 306 total lane miles of roads in Dunwoody. 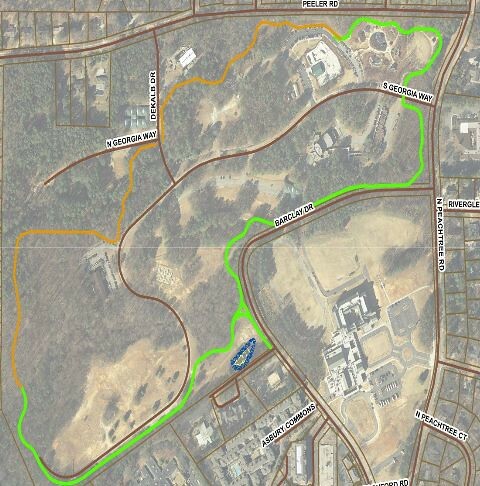 Initial plan released for Dunwoody's next new park located at Shallowford and Pernoshal. The City has released plans for a New Park / Playgrounds / Amphitheater / Picnic Shelters / Open Green Space connected on the Brook Run Trail at the corner of Shallowford and Pernoshal. 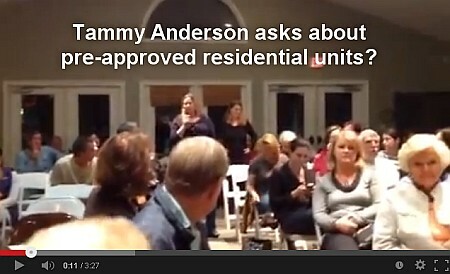 What do you want to see in Dunwoody's next park? Please review the complete document and give us your thoughts. I see that the current plan states that it has a hard surface multi-purpose sports court (to accommodate volleyball, soccer, lacrosse, etc ???) but it to me it is missing a dedicated basketball court. To the best of my knowledge the city does not have a single outdoor basketball hoop on public grounds anywhere within the city limits (except for a few semi unlawful ones placed in culdasacks) and every elementary school has removed all hoops from their outdoor playgrounds. Looking at the drawing above it appears to me that an additional basketball court could be added to the right of the multi-use court above. Several years ago, a basketball hoop was installed by residents in the middle of the 16 acre pipe farm and there were people playing playing there on a regular basis. The additional full size regulation court could be used by teenagers and adults whereby I am guessing that the multi-use court would be utilized mostly by kids. Following Council review and discussion on Tuesday, staff recommends a public meeting to share this updated park concept with the community. 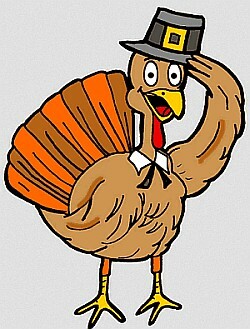 The public meeting is being planned for the week before Thanksgiving, tentatively November 19, 2013. Staff will then bring back any revisions to the plan to the Council in December. Brook Run Trail Phase II completing loop in park up for December approval. Phase III crossing creek at back of Brook Run to join new park will be coming soon. Administer Oath of Office to Officer Jeremy Massengill. Proclamation - Alzheimer's Disease Awareness Month. YTD Financial Report for September 30, 2013. Updated Concept Plan for Renaissance 5 Acre Park on the 19 Acre Property. Related to the Detective, Crime Analyst and Deputy Court Clerk Positions. Approval of Agreement with Georgia DOT for Perimeter CID Bike Plan. Discussion of Contract Award ITB 13-09 Brook Run Park Multi-Use Trail Phase II. Discussion of 2014 Website Redesign Contract Award. FIRST READ: Discussion of Amendments to Chapter 6, Animals - Nuisance. I started getting questions late this afternoon about fences going up around the long vacant Blockbuster Video Store on Mt. Vernon as people were excited to know what was going on. After I informed them that another bank was entering the community, the excitement usually faded. The property is zoned neighborhood shopping / commercial and the owner of the land can develop it as he sees fit within the allowances of the zoning code and a bank is an allowable use for the area. 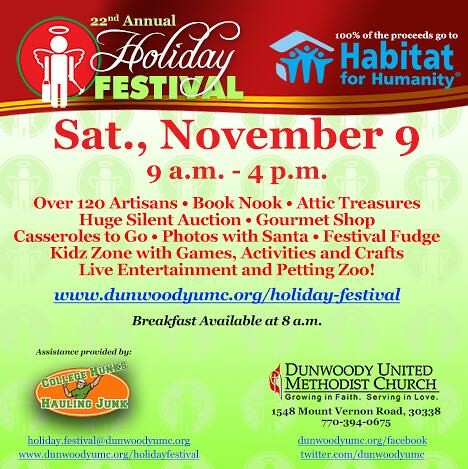 Over 130 Artisans • Book Nook • Huge Silent Auction Attic Treasures • Gourmet Shop • Casseroles to Go Photos with Santa • Kidz Zone with Games, Activities and Crafts Festival Fudge • Live Entertainment and Petting Zoo! Photos with Santa available by appt or walk-in, bring your own SD card for high quality digital images. 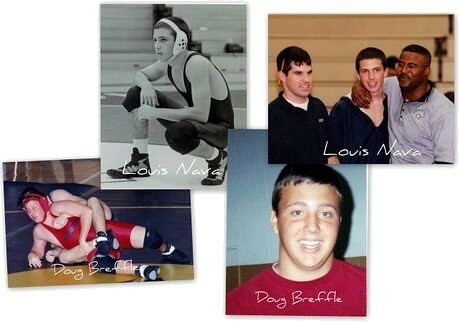 Our club was started to honor the memories of Louis Nava and Doug Breffle. These young men were Dunwoody High School students who loved the sport of wrestling! You can read more about the club in these articles at The Dunwoody Crier and The Dunwoody Patch. The purpose of our wrestling club is to introduce and teach the sport of wrestling to children in the Dunwoody area from ages 6-14. The club offers various opportunities for the differing levels of competence. Children will develop as they advance in the sport. It will also prepare middle school children for their entrance into the high school wrestling experience. In addition to actually teaching the sport, we will provide a positive environment to teach the values of team, self-discipline, and a strong work ethic. These are essential skills for success in wrestling, academics, and life. All wrestlers and coaches will be required to have a USA Wrestling Card to participate in the club. Cards are purchased online from the Team Georgia Web Site. Dues for the club are $75.00. Payment should be made through Paypal via the registration portal. Gary Hammond and David Bertrand will be the the Head Coaches for the 2013-2014 season. The Breffle and Lynn families, along with Dunwoody varsity coach Luke McSorley, will be assisting in the running of the club. Parent volunteers are always welcome — please feel free to contact the club; use the contact us button above to send us an email directly. We look forward to working with your children and sharing with them the exciting sport of wrestling. 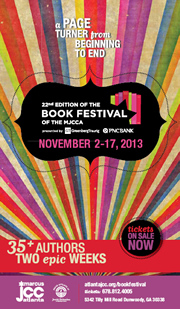 For 21 successful years, the Book Festival of the MJCCA has provided our community with a literary extravaganza featuring an exciting lineup of the year's most exceptional authors, speakers, and celebrities. Please join thousands of your fellow book lovers to listen, meet, and interact with your favorite authors in a variety of forums, including author meet-and-greets, book signings, a community read, and panel discussions. 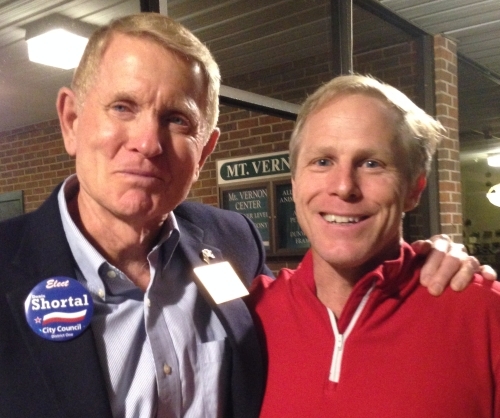 Shortal, Wescott and Thompson for A Better Dunwoody on Election Day. Tuesday is election day here in Dunwoody and I hope you make it to the polls before the 7 pm closing time. Predictions are that turnout will be low therefore just a few votes could swing these contests in either direction. 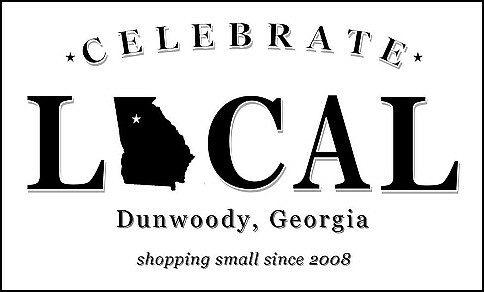 As a resident of Dunwoody for the last 15 years and as a member of the City Council since inception, I am very proud of the many accomplishments that we as a community have collectively made in making this a better Dunwoody. I have done my best to provide you the information on the candidates, in a positive manner without going negative in anyway. Unfortunately I can't say the same with all aspects of this election and hope that we can put this behind us to move our great city forward. With one guaranteed Council seat change, I am looking forward to the new member adding positive energy into discussions that we have been missing for awhile and if the other two seats had the incumbents returned I would be overjoyed as they have served us well. I would like to thank all eight of the candidates for submitting their names forward for elected office and no matter who is elected at the end of the day, I hope that everyone will stay engaged to add value to our community. As a member of Council, I have a very an active desire to know who will be sitting with me and where they stand on the various issues. I have done my due diligence on that subject as I have attended (and filmed) the Political Forums, read all candidate statements, articles, letters to the editor, private emails, blog and Facebook posts to find out about the candidates. For me a top three have emerged far above the others and the excerpts of the article below closely mirrors my thoughts on the positive aspects of the three recommended. The power is in your vote, please use it govern the future of Dunwoody. Thank you. An email sent by Tammy Anderson, the wife of the former City Attorney Brian Anderson hit my inbox several times this evening by residents asking my opinion of what was written. The letter is posted down below for all to see but it also mimics Ms. Anderson's question at the Political Forum for Young Families therefore I will use it and the answers provided by Candidates Heyward Westcott and Doug Thompson as both were spot on as far as the "Grandfathering" is concerned. Zoning entitlements can not be taken away as Tammy states and the email miscommunication on her part almost seems deliberate. When attempting to sway last minute public opinion (like in this election), there is a tactic to use what is called "FUD" which stands for Fear, Uncertainty and Doubt to influence perception by disseminating negative and dubious or false information. The "Clean Slate" platform has little substance and few facts in which to have a real platform to move this city forward therefore we are witnessing that a negative campaign is now being waged. Please allow me to raise several facts. Fact - 6,000 apartments are not pre-approved in Dunwoody and to verify my statement pull up this link and follow the directions. 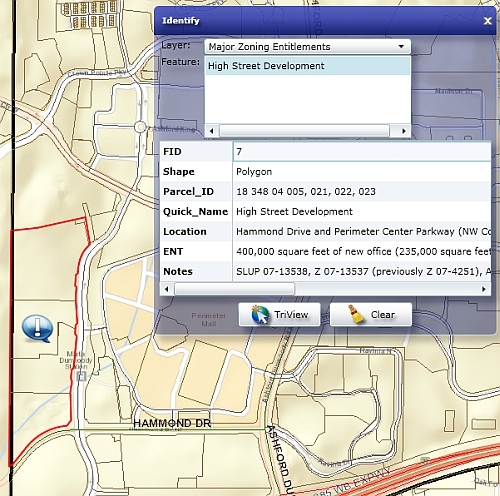 Second, while looking at the pre-approved entitlements on the City of Dunwoody GIS System, remember that State Farm just bought the Novarre Site that is kiddy corner from the Dunwoody Station therefore say goodbye to those possible 900 condos that were pre-approved because State Farm will only want office space. Click everything that is red on the city site and you will have a very hard time finding much residential except for the High Street project. Fact - the current City Council has worked to limit residential density for years by modifying every master plan to almost specifically state that. Below are a few articles I posted. High Street has the zoning entitlement rights to install a very large mixed use development with office, retail, hotel and residential. The residential aspect includes 1,500 condos and 1,500 apartments but as the two candidates stated, it will be the negotiation process where these numbers will be lowered. 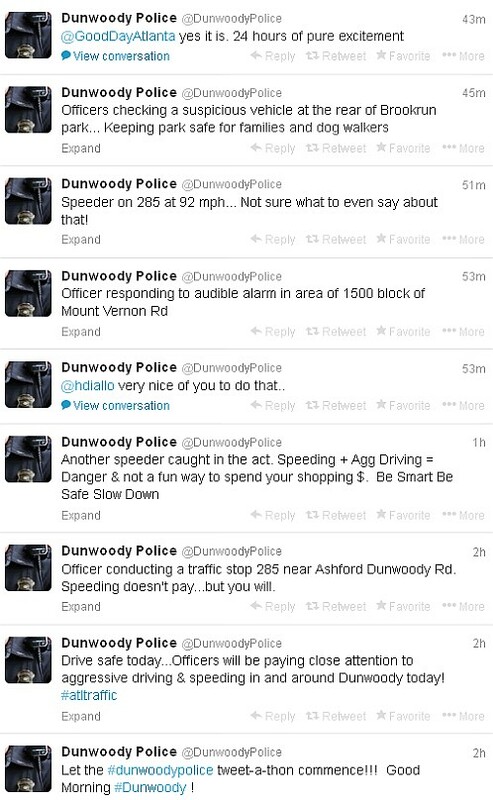 Finally below is the letter from Ms. Anderson that she sent far and wide in the Dunwoody Community. Please don't be afraid of the letter as you now have the Facts over FUD. apartments will significantly upset this balance. community. The impact on schools and infrastructure will be devastating. control when becoming a city. “grandfathered” DeKalb County apartment projects.